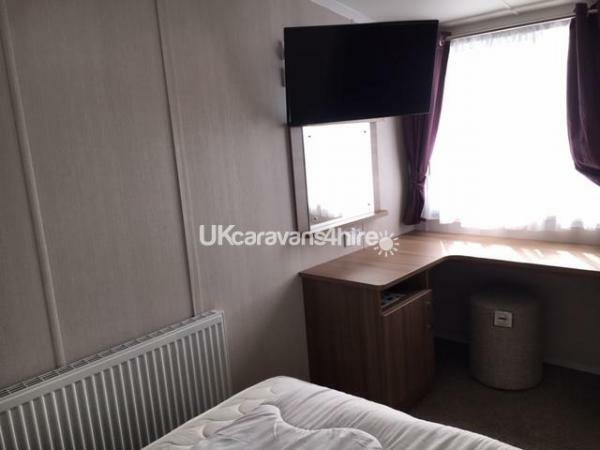 Additional Info: Coffee machine, TV / DVD in all rooms, games console and games, family board games, iron and ironing board, hairdryer, outdoor equipment (ball, buckets, spade, kites), DVD/Films, and Books. 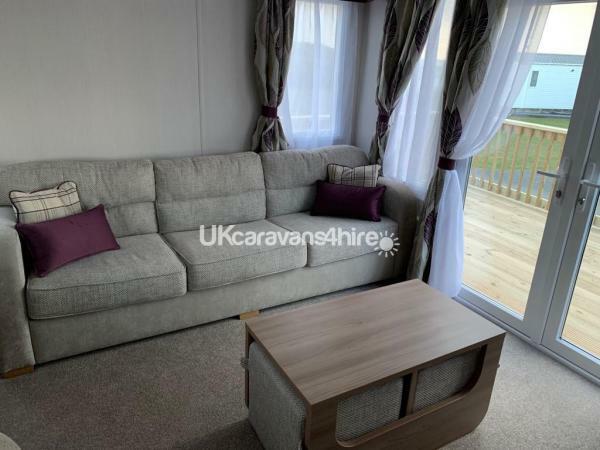 We're excited to present our brand new holiday home located on Perran Sands holiday park, its in a prime spot for easy beach access and outstanding views! Within 1 minute walk is a flat green field where the children / pets can play ball, kites or just run around! The park amenities are just a short picturesque walk away. Please see the Haven website for more details. 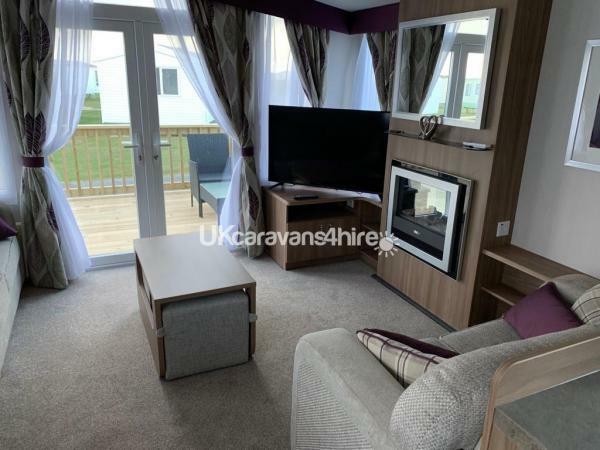 A 2018 model, this caravan has full double glazing and central heating throughout, this means you can holiday at any time of the year and be assured to remain warm and comfortable. 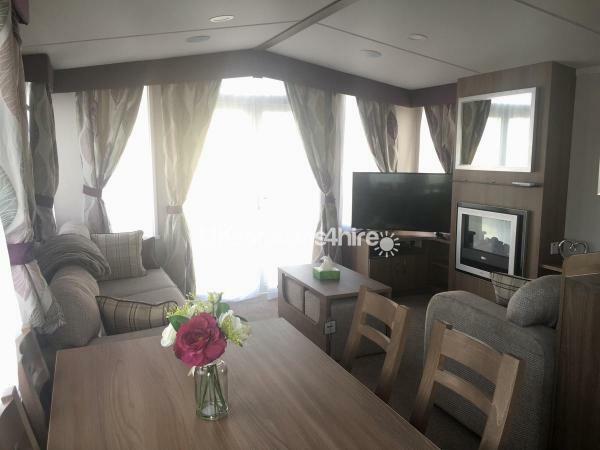 Our caravan is a 'Prestige' equivalent, and the added extras makes our caravan more homely. 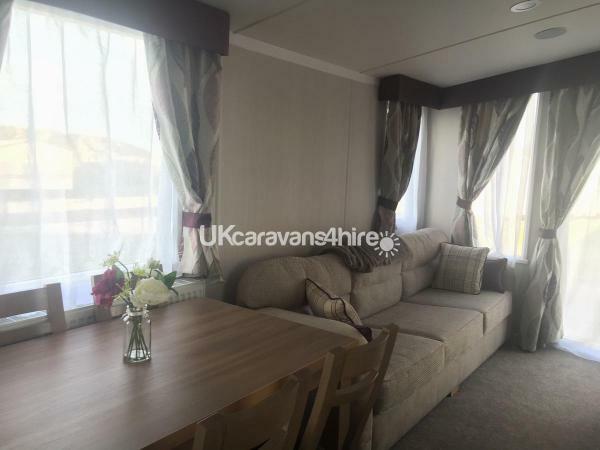 The living area is cosy and comfortable with two sofas, and modern and stylish decor. One sofa pulls out to a double bed. The 49" flat screen TV is a great addition to this family area, and we have also included a Wii and games for the convenience of the children. There is a free standing coffee table with pull out seating, ideal for a family game of cards! Double patio doors lead out onto the decking area. 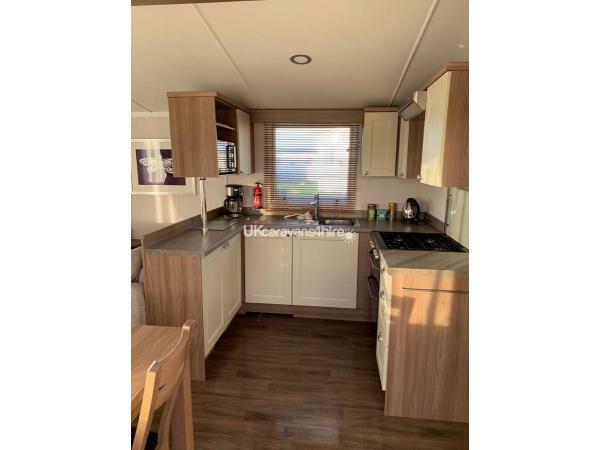 The kitchen/dining area is suitably equipped for those occasions when you wish to cook and comprises of a full sized integrated fridge freezer, a 4 burner gas hob, oven and grill, microwave, kettle and toaster. All kitchen utensils are available, and plenty of storage for your shopping! For those coffee lovers, we have provided a coffee machine. A free standing dining table with 6 chairs completes the dining area, perfect for those family breakfasts before planning your day at the beach, or in town. There is storage area for shoes, umbrellas etc to avoid cluttering the living space. 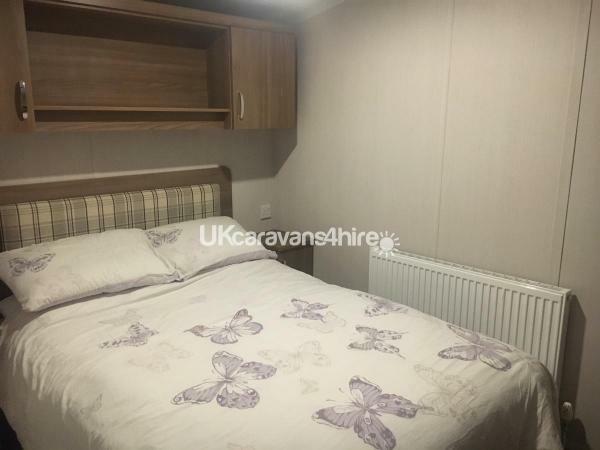 A place of tranquility for a good nights sleep, has a double bed with duvet and pillows, side cabinets and plenty of wardrobe storage. A dressing table with vanity mirror, equipped with hairdryer and a flat screen TV. The ensuite toilet completes the amenities in this room. Fitted within are USB sockets for charging those all important electronic devices. For the book worms we have left a variety of titles which may/may not suit your taste - take a look and see! 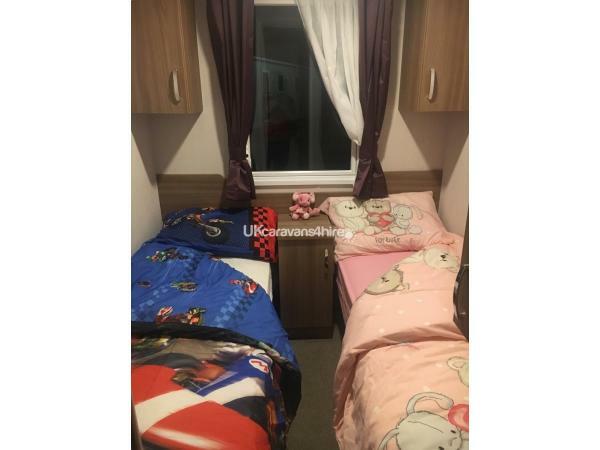 Both bedrooms have two single beds, complete with pillows and duvets, further wardrobe space and 21" TV/DVD combi with a variety of DVDs for those nights when you fancy a night in. The beds can be moved together to make a double if required. 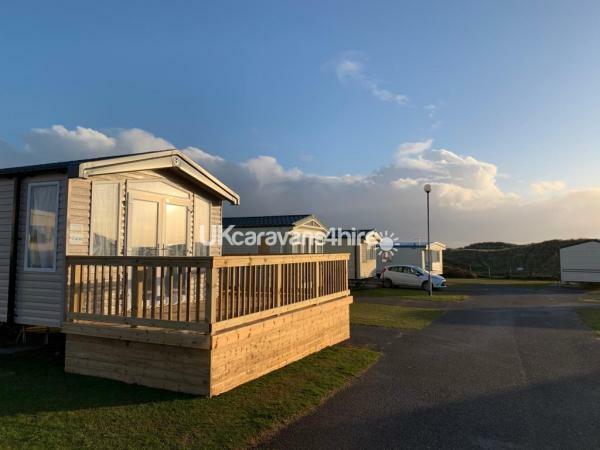 New in 2019, full wrap around decking including gate has been fitted to our wonderful holiday home. To complete this outdoor area we have provided luxury outdoor furniture, allowing a place of relaxation to enjoy a glass of wine, read a book, or watch the family play. 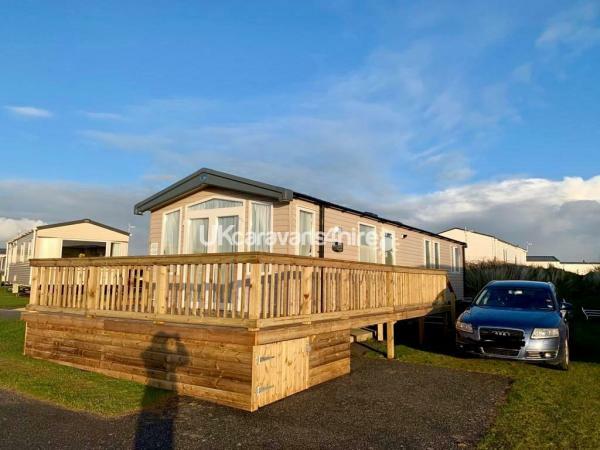 There is ample car parking space for 2 or more cars alongside the caravan. Please note: A security deposit will be required, park passes are not included into the price and linen and towels can be included at an additional cost (please request on booking).